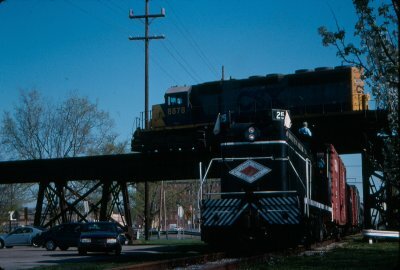 Our first runby was an under-over photo with CSX 8878W at Connersville. We then moved down to the future Whitewater Valley museum site where Dearborn Tower was already being rebuilt. The town of Laurel provided the perfect backdrop for a runby. Just south of Laurel we crossed the Whitewater River where the bridge made a perfect photo location. Posing the train on the bridge allowed plenty of photo angles for the many riders. Another shot on the Whitewater River bridge. We made a quick stop at the site of the former Jinks Lock and the diversion dam on the nearby river. We almost skipped the runby at "Triple-Crossing Curve" but it turned into smoky perfection with photos being published in numerous hobby magazines. At the former canal town of Metamora, we walked the train through town on normally unused track to get some very unique images downtown. The canal's covered bridge also made a great backdrop. After a return to Connersville, an evening trip returned to Metamora for a series of night photos with the train finally returning to Connersville at 2 AM. Thanks are due to all the crew members of the Whitewater Valley! A great prop - the former IOOF building. Back to the covered bridge for more photos. Notice the neat details inside the bridge. What a way to finish a long day!